With all espresso machines, you’ll want to read and follow the instruction manual initially, and refine your technique as you become more comfortable with the piece of equipment. 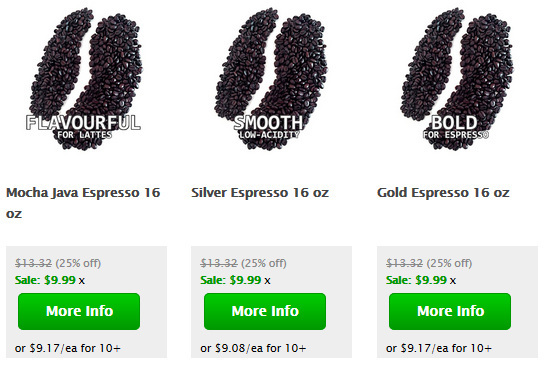 If you are using a Steam-Driven Espresso Machine you should grind the espresso beans extremely fine. Steam-driven espresso machines typically have a screw-on lid on the top where you can pour water into the machine. If you have a pump-driven espresso machine you can use a slightly coarser grind for the espresso coffee beans. A pump-driven espresso machine typically has a large water reservoir as well as a front panel with buttons. When grinding the coffee use a conical burr grinder rather than a blade grinder. This will give a more consistent grind size and also will avoid overheating the beans during grinding. Environmental factors including humidity and temperature may also require you to adjust your grind size. There may also be variations required if the coffee was stored improperly. The barista must weigh all of the factors involved and make a determination about the proper grind size. For tips on brewing the perfect cup of coffee see our section on Coffee Brewing. We also provide the flavor profiles of the world’s top Specialty Coffees and helpful tips on preparing Espresso Drink Recipes. For espresso brewing tips see the How to make Lattes and Cappuccinos. Detailed definitions of coffee terminology can be found in the Coffee and Espresso Glossary. Also check out the World’s Best History of Coffee.